The only thing better than seeing Star Wars on the big screen is seeing it on an ever bigger screen. Rogue One: A Star Wars Story will be hitting IMAX and standard theaters this December, and while we have yet to learn when tickets go on sale, we now have a a way to win some. The newest episode of The Star Wars Show just dropped and hosts Andi Gutierrez and Peter Townley shared some exciting details about a new Rogue One sweepstakes. 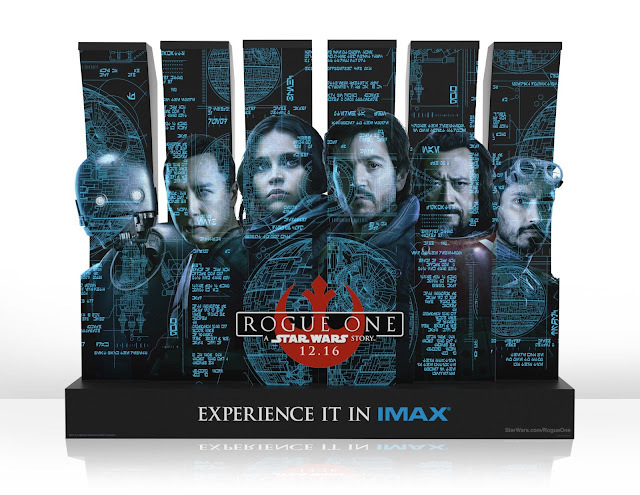 Beginning November 3rd, fans should be on the lookout for exclusive Rogue One standees inside select IMAX theaters. 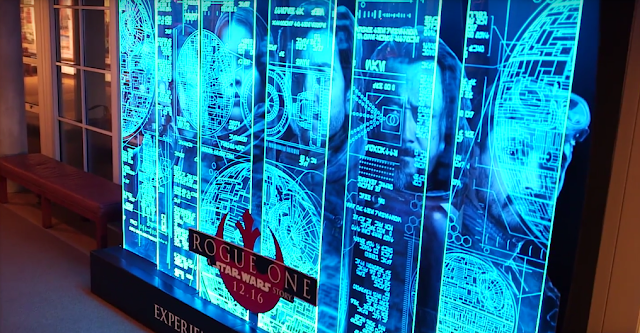 The displays are similar in design to the recently revealed Rogue One character posters, featuring the faces of the characters behind blue holographic views of the Death Star plans. The standees will also include secret Aurebesh messages hidden throughout. To participate in the sweepstakes, you must find one of these standees and take a photo of yourself in front of it. Those who post their pictures to Twitter with the hashtag #RogueIMAXsweeps will be entered for a chance to win a trip for two to IMAX headquarters in Los Angeles to see Rogue One with director Gareth Edwards and the IMAX team. You may enter up to once per day in November between the 3rd and the 27th. Official rules can be viewed by clicking here. Rogue One: A Star Wars Story opens in theaters on December 16th! You can learn more about where to catch it in IMAX by visiting their official website.